A van has hit crowds of people in the Ramblas tourist area of Barcelona. Spanish officials are treating the incident as a terrorist attack. Police say several people have been injured in a “massive crash”, while emergency services are urging people to stay away from the area around Plaça Catalunya. The attack comes at the height of the city’s circuit season, with tens of thousands of gay men holidaying in the city. El Pais newspaper reports that the driver of the vehicle fled on foot after mowing down dozens of people. 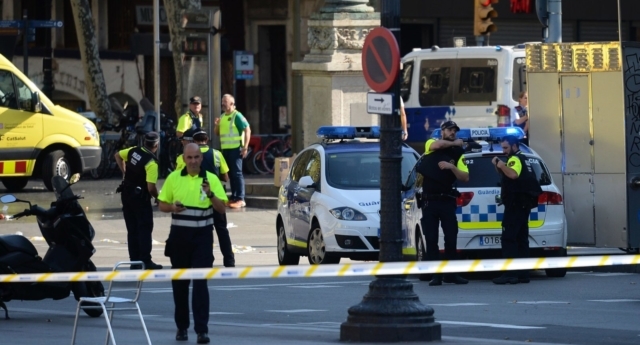 Authorities have requested local metro and transport hubs be closed, and emergency services are urging people to stay away from the area around Plaça de Catalunya. The city’s circuit festival has become world renowned for its parties – attracting huge numbers of gay tourists. Gay and bisexual men from around the world fly into Barcelona for the two week event, with most visiting Barcelona this week and this weekend for the event’s ‘main party’ and WE party. It is not yet known who was affected by the attack, but reports on the ground say many are taking safety in shops and cafes around the affected area. PinkNews has contacted Circuit Barcelona for comment. Steven Turner, who works in the area, told BBC News: “People in my office saw a van ramming into people on La Ramblas. Anti-gay neo-Nazi website Daily Stormer apparently ‘hacked’ by Anonymous – but is it a hoax?